Some say that bull markets climb a wall of worry. This is good news for those already in the market. Worriers will help the market go higher later when they finally decide to jump on the bandwagon. Herding and regret aversion (fear of losing out on future profits) should eventually overcome loss aversion. The iconic investor and money manager, Sir John Templeton, said, “Bull markets are born on pessimism, grow on skepticism, mature on optimism, and die on euphoria.” The current bull market in U.S. stocks, though longer in duration than many previous bull markets, has not yet garnered a lot of investor confidence. It is still in the skepticism stage. Perhaps investors have remained fearful due to the two bear markets of the past 20 years when stocks lost half their value each time. Even though the U.S. stock market is around new highs, investors are still skeptical about further gains lying ahead. According to the AAII Sentiment Survey, at the end of May the percentage of individual investors optimistic about stock market gains was at its lowest level in 11 years. Investment flows have also reflected lackluster investor interest. Only 52% of U.S. adults are invested in the stock market. This is tied with 2013 as the lowest level in 16 years. The cumulative flow into mutual funds and ETFs is 25% lower than it was 18 months ago. Among professional money managers, allocations to U.S. equities are near an 8-year low, and cash levels are at their highest level in 14 years, according to the latest Bank of America Merrill Lynch Global Fund Manager Survey. With the U. S stock market at new highs, sentiment has shifted from the market being in a “distributional top” pattern to it being “overpriced.” High valuations may mean lower expected returns over the next 10 years, but it does not mean valuations cannot get even higher. In April 1996, the Shiller CAPE ratio was at 25, near where it is today. But the CAPE ratio continued to rise over the next 3 years until it reached a high of 43 in November 1999. The S&P 500 gained another 138% during that time. From that level, the S&P 500 lost 9% over the next 10 years. But look at what happened with our Global Equities Momentum (GEM) model that took advantage of shorter-term fluctuations in stocks and bonds to earn extraordinary returns during that time. Source: Sharpereturns.ca Results are hypothetical, are NOT an indicator of future results, and do NOT represent returns that any investor actually attained. Please see our Performance and Disclaimer pages for more information. Since most investors are not familiar with the benefits of dual momentum, they have gravitated toward factor-based “smart beta” funds. According to Morningstar, the amount of assets in smart beta funds grew from $103 billion in 2008 to $616 billion at the end of 2015. As of October 1 of last year, $110 billion of that was in “low-volatility” funds, which investors may think lessen the risks of investing. BlackRock projects that smart beta ETF assets will reach $1 trillion globally by 2020 and $2.4 trillion by 2025 . This is an annual growth rate of 19%, double that of the overall ETF market. Low volatility and factor (multi and single) funds are expected to be key drivers of this growth. They represent more than 60% of new smart beta inflows through 2025. Smart beta ETFs saw $31 billion in new fund flows globally in 2015 with minimum low volatility ETFs accounting for $11 billion of it. The largest of these low volatility ETFs, the iShares Edge MSCI Min Vol USA ETF (USMV) has $13 billion, and 40% of those assets were contributed just this year. The large inflow of capital into low volatility stocks has bid up the return of USMV for 2016 to 8.6% versus 3.5% for the iShares S&P 500 ETF (IVV). The P/E ratio of USMV on a trailing 12-month basis is now 24.8 versus 18.8 for the S&P 500. The P/B ratio of USMV is 3.2 versus 2.5 for the S&P 500. Arnott et al. (2016) show that high valuations of factor and smart beta strategies are negatively correlated with future returns. Investors jumping on the low volatility bandwagon now may be disappointed when prices return to more normal levels. What about the advantages that smart beta in general are supposed to give investors? A Vanguard study showed that smart beta outperformance relative to cap-weighted benchmarks from 2000 through 2014 can be traced to systematic risk-factor exposures. After accounting for market, size, and value risk factors, none of the smart beta strategies showed results that were significantly different from zero. In most cases these strategies produced negative excess returns after accounting for their risk-factor exposure. Glushkov (2015) looked at the performance of 164 smart beta ETFs from 2003 through 2014 with respect to benchmarks based on size, value, momentum, quality, beta, volatility and other risk factors. He also found no conclusive evidence that smart beta ETFs outperformed their risk-adjusted benchmarks over this period. Backtest overfitting is also a serious problem for smart beta strategies. Suhonen et al. (2016) examined 215 smart beta strategies across five asset classes. They found a median 73% deterioration in the Sharpe ratio between backtest and live performance periods. The deterioration of Sharpe ratios was most pronounced among the most complex strategies. 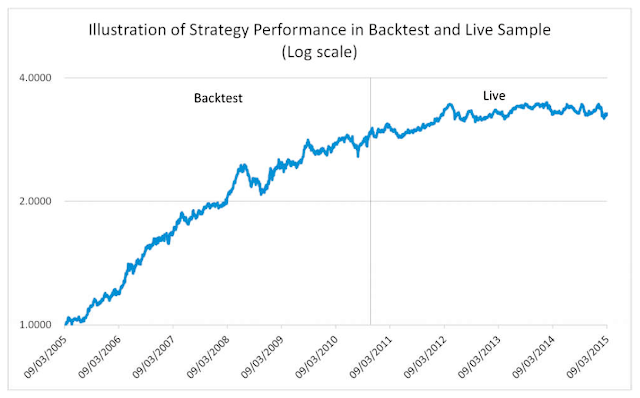 Their reduction in Sharpe ratios was 30% higher than those of the simplest strategies. As other research has shown, intensive back testing and complex modeling often pick up more on noise patterns in the data than on the underlying signal processes. Very few still believe that the markets are perfectly efficient. Since there is plenty of contrary evidence now, many think it is not difficult to do better than the market. 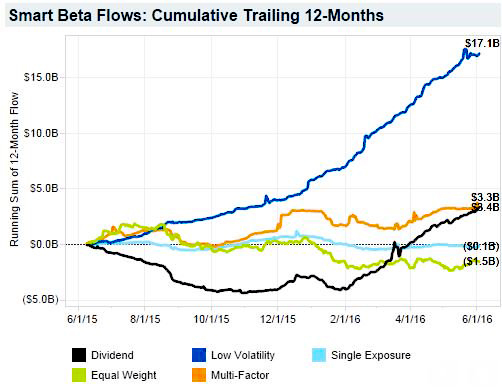 But we should remember that smart beta is still just beta. It may not give higher risk-adjusted returns. Furthermore, we can define risk in different ways. Academics equate risk with volatility, but that is too limiting. Long Term Capital Management, founded by academics, did well by exploiting derivative mispricing. But unforeseen liquidity risk wiped out all their gains and most of their capital. It also nearly led to the collapse of the world’s financial system. There are also unrecognized risks in other investment factors. Some people were surprised that value and momentum were left out of Fama and French’s latest factor pricing model. 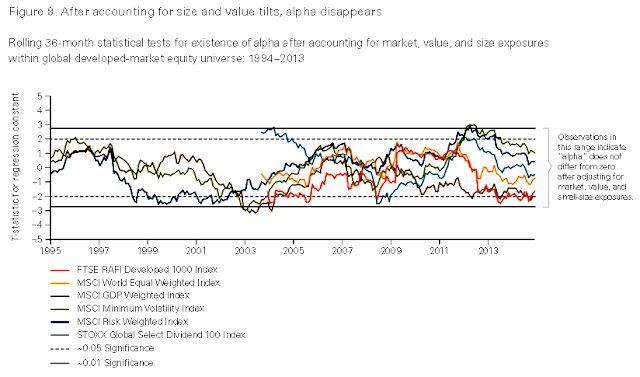 But value investing has had eight steady years of severe benchmark underperformance. I call this kind of tracking error “relative performance risk.” It may explain why investors need higher returns from value investing. There are unrecognized risks with stock momentum investing as well. Momentum works best with focused portfolios of 100 or fewer stocks and when portfolios are rebalanced frequently. There is now substantial capital invested in single and multi-factor funds that use stock momentum. More capital is coming into momentum at an increasing rate. Every month Alpha Architect freely discloses on their website the top 100 momentum stocks. But stock momentum is a high turnover strategy with 25-30% of the portfolio typically replaced with every rebalance. There may be a significant scalability problem when hundreds of billions of dollars tries to enter and exit the same 25 or 30 stocks each month or quarter. 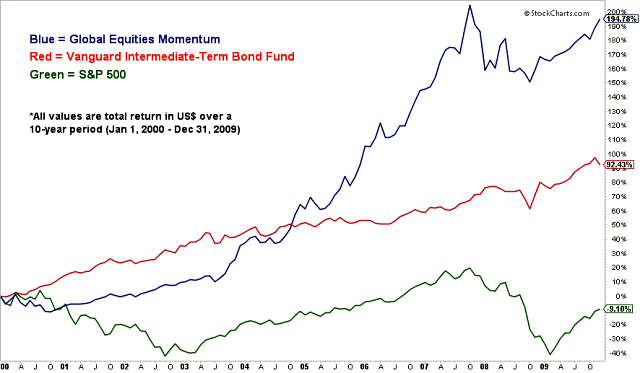 Momentum also favors volatile stocks with wide bid/ask spreads. Wide spreads combined with high portfolio turnover lead to high transaction costs that can eliminate much of the excess return we see when we backtest momentum strategies. Markets are not easy to beat when you consider all the risks. 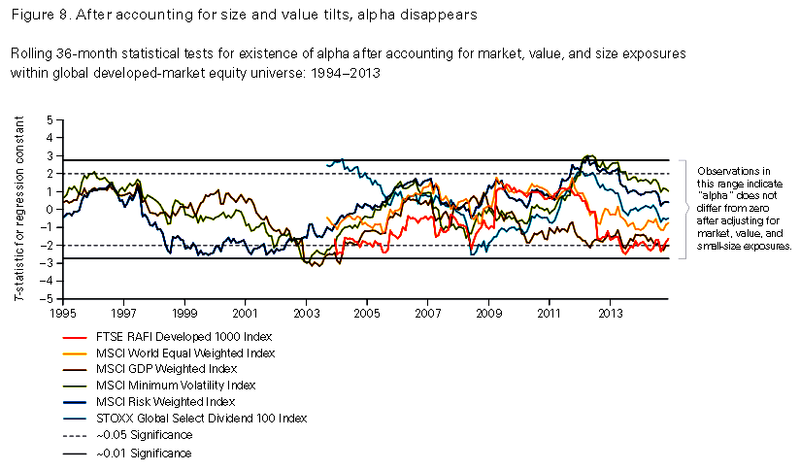 Many investors in smart beta or other actively managed funds pay higher expense ratios and still underperform. Compare that to the cap-weighted Schwab U.S. Large-Cap ETF (SCHX) that holds 750 stocks. Its annual portfolio turnover is just 4%, and its expense ratio is only .03%. That makes SCHX hard to beat as a buy-and-hold investment. As small companies grow and prosper, they naturally become an increasing part of a cap-weighted portfolio, while poor performers receive less weighting over time. Cap-weighting lets your profits run on and cuts your losses short. For example, the largest stock holding in the S&P 500 index is Apple. It is worth more than General Electric, General Motors, and McDonalds combined and more than the 100 smallest holdings combined. How many bought Apple in December 1982 when it became part of the S&P 500 index at a price of 48 cents a share (adjusted for dividends) and have held it continuously since then? Investors often prefer more complicated approaches that sound good, like smart beta or multi-factor funds, but simpler often is better. See When Genius Failed: The Rise and Fall of Long-Term Capital Management by Roger Lowenstein (2000).